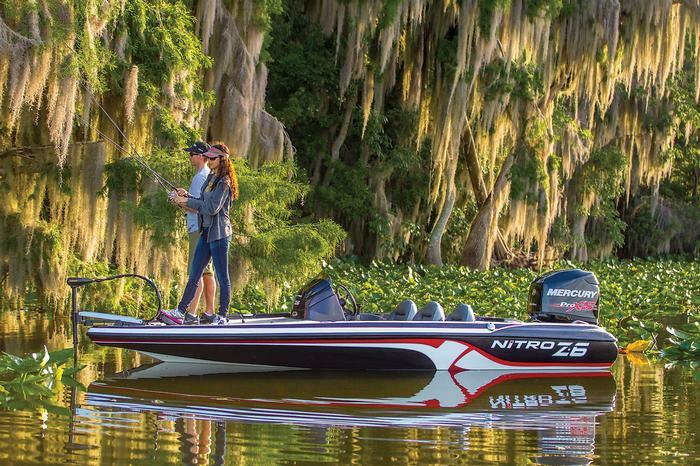 At an impressive 20′ 9″ (6.32 m) long with a 96″ (2.44 m) beam, the NITRO® Z-9 continues to stand as the pinnacle of professional-level performance bass boats. And it does so by continuing to provide industry-leading (and tournament-dominating) performance to get you where the bass are hiding. The proven features you need to help you reel them in and keep them safe until you get back to the weigh-in. And the confidence to know that even when the water conditions are rough, your NITRO Z-9 will be ready to quickly and safely help you fish your best. 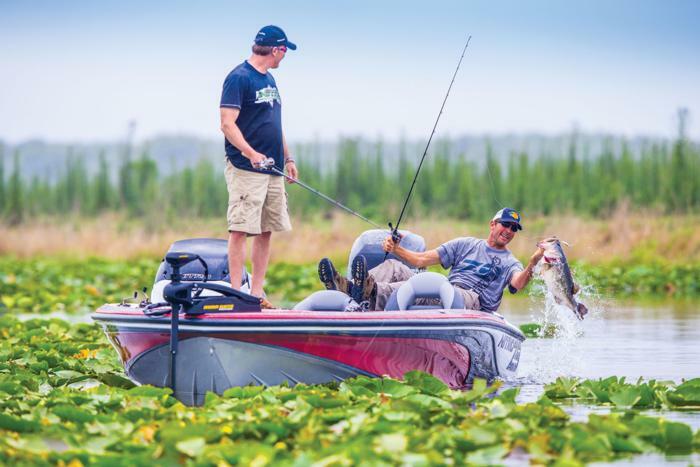 The second you pick up your new NITRO Z-8 performance bass boat is the second you’ve earned the right to brag to your buddies about how awesome your boat is. And brag you will! Because neither you or any of your fishing buddies (or even your competition) will find a more tournament-ready boat in this size, or for this value! Inside, it packs all the features anglers on every level of competition need to fish their way up the leaderboard. And on the outside, it sports the NITRO fiberglass performance hull needed to leave your competitors in your wake as you race your way to your destination. From stem to stern, the Z-7 performance bass boat from NITRO® crams more value into its 18′ 8″ (5.69 m) length than any other boat in its class! Whether you take yours out on a weekend run with a buddy (don’t forget to install the optional removable port console at home!) or use it to compete in a fast-paced tournament on a lake in your area, you’ll have all the gear, electronics and accessories you need. All right at your fingertips! 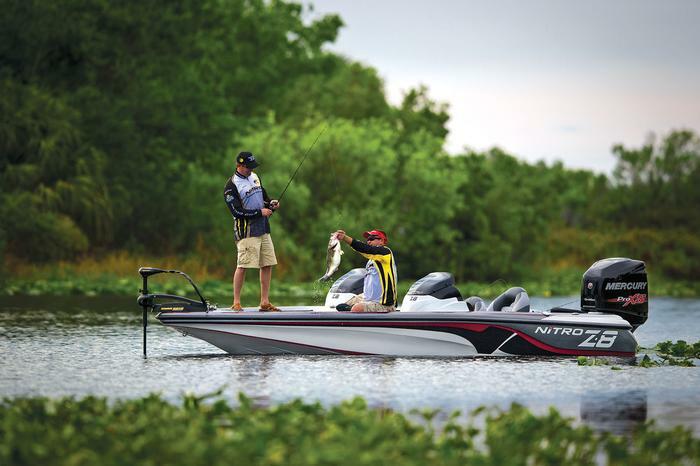 And, like all NITRO fiberglass performance bass boats, it’s bred to run with a well-designed performance hull loaded with features to achieve class-leading speeds, holeshots and overall handling. Nimble performance meets tournament features! 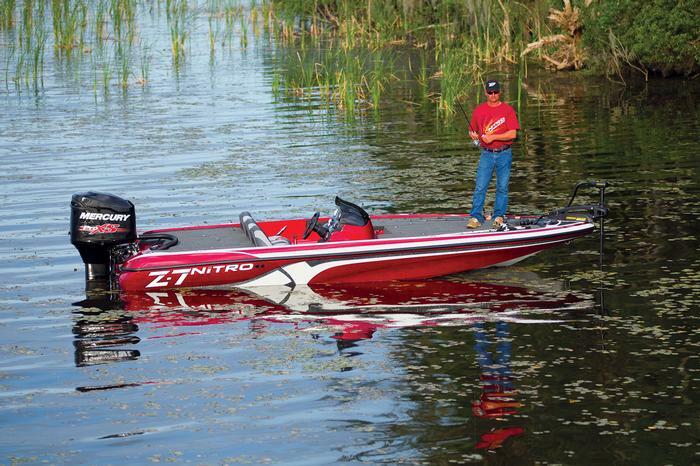 The NITRO® Z-6 is much more than an “entry-level” fiberglass bass boat. In fact, it has much more in common with its larger siblings in the Z-Series than it does with other boats in its size class, including great holeshots and incredible overall performance. And don’t forget how it’s built for serious local tournament bass fishing (or even just a friendly outing with a buddy) with plenty of top-tier fishing features and amenities throughout, as well as sizable casting decks fore and aft. The Z-6 just fits all of this into a nimble, easy-to-tow performance package geared toward everyday anglers. And all at an industry-low price!